Now you can programmatically send CasaTunes a custom text message, have CasaTunes convert the message to audio, and play the audio in any combination of rooms in your home. http://CasaServer.local:8735/api/v1/system/tts/input/Introducing the latest feature from CasaTunes. Send a message to any combination of rooms. Nice, but the capabilities of CasaTunes TTS go much further. In addition to text input, CasaTunes also supports messages composed in SSML, or Speech Synthesized Markup Language. SSML allows absolute control over how your message is played back, allowing you to add pauses, emphasize words, control how words, like numbers are spoken, and much more. Plus you can select the voice and language to use when playing back your message. You can select a specific gender, select a specific language, for example: English, Spanish, German, French or any other supported language. Plus, when you select a language, for example English, you can select whether you want an Aussie, British, or American accent. You decide! 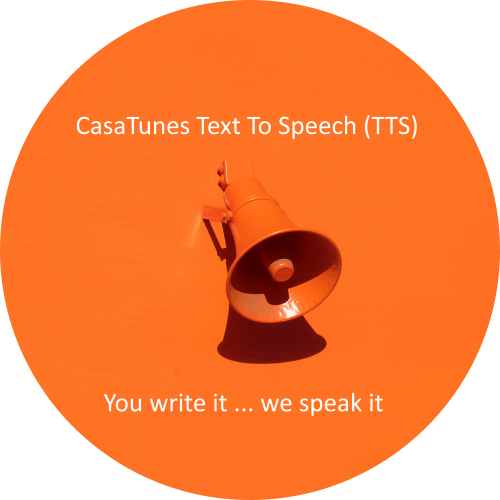 You can use the CasaTunes Development Tool (CasaDev) and the CasaTunes REST Api for TTS to discover and select the perfect voice to use, and to test playing your messages. Using the CasaTunes REST Api, you can customize your text or SSML script, optionally select a time to wait before and after the text is played back (for example, to allow for delays when powering rooms on), select the voice to use, the language, the gender, the room or room group, and even control the playback volume.